My groceries for a week. A day of Sludge done with, I was relieved to get into more hearty dishes. 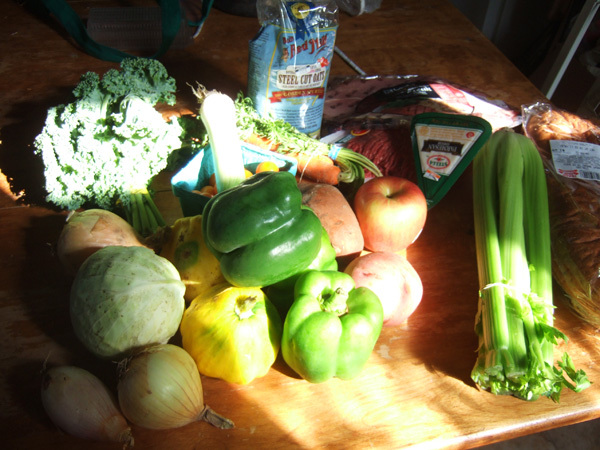 Above, my groceries for the week:, at a cost of $35 in total; including $10 worth of vegetables from my CSA, $5 for some un-homogenized milk from Ronnybrook farms, and the rest spent on bread, cheese, etc. For breakfast, I had (in Fisher’s words): “…piles of toast, generously buttered, and a bowl of honey or jam, and milk…You can be lavish because the meal is so inexpensive. You can have fun, because there is no trotting around with fried eggs and mussy dishes and grease in the pan and a lingeringly unpleasant smell in the air.” Toast it was! Deep, brown, whole wheat bread, fresh from my local bakery. Buttered, with a schmear of honey, and a glass of milk. Done. For lunch, I consulted the chapter “How to Boil Water” for Fisher’s lunch recommendation: “a heartening, ample soup.” With a drawer full of vegetables, I decided to make “A Basic Minestrone.” I was interested in Fisher’s interpretation of the classic Italian dish. “Probably the most satisfying soup in the world,” she says, ” for people who are hungry, as well as for those who are tired or worried or cross or in debt or in a moderate amount of pain or in love, or in robust health, or in any kind of business hugmuggery, is minestrone.” Sounds reassuring, doesn’t it? From How to Cook a Wolf by MFK Fisher (1942). 1/4 bacon or salt pork or fat ham. I cut the fattiest pieces off a ham steak I bought for dinner later this week. I put this fat in a large soup pot, and let it render before I added the onion to soften. Ham fat as a soup base? Delicious. Then in went the celery, parsley, and herbs, and left to soften for 10 minutes. Last, the tomato (I used canned), stirred constantly until heated through. Then, I added two quarts of water. At this point, Fisher recommends adding whatever vegetable you have on hand (but never beets! ); I added 1/2 a small, green cabbage; 1 potato; 2 cloves garlic; 1/2 an acorn squash; 2 carrots; 2 stalks celery; and a handful of kale. Fisher recommends chopping these fine; then mashing them with a potato masher…While I can’t explain Fisher’s obsession with smooshed food, I decided to simply leave the veggies finely chopped. I brought the soup pot to a boil, then turned it down to a simmer, and let it cook until the vegetables were tender, about an hour. When deprived of seasoning for a time, one forgets the richness it adds to a dish. As the soup simmered, it smelled like sweet summer days and freshly cut lawns: green and spicy. 20 minutes before serving, I added a cup of dried macaronis. Then, just before ladling it into bowls, Fisher says to “Churn the soup ferociously, and serve over thin toasted bread or not, but always with a good ample bowl of grated dry cheese to sprinkle upon each serving, as the pleased human who eats it may desire.” I adorned my soup with grated Romano. The soup, it turns out, was o.k. I’ve had better; I feel my addition of kale instead of spinach wasn’t such a good choice. It made the soup olive green and a little stinky. But the soup wasn’t bad, either. It was warm and filling, and I felt ready for the rest of my day. Tonight, we’ll continue with our Italian theme for the day, with a vegetable Frittata. That’s a pretty accurate description of me; maybe I should insert it in my OkCupid profile. I’m certain that will find you a Lover.